It is not easy to build a clock. When my daughter got married, I decided to build a clock as an heirloom wedding present. 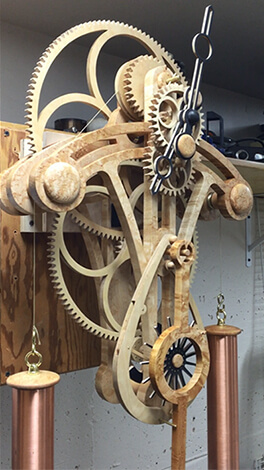 An accomplished designer, Clayton Boyer, offers a variety of plans for clocks that can be built almost entirely out of wood.1 His website and linked YouTube videos show ample examples of others who have built these delicate machines successfully and in several artistic iterations. Presented with the set of plans, which I considered akin to a validated methods section, I set out to build a wooden clock. Over a few months’ period preceding the wedding, my evenings were filled with cutting each tooth of every wheel freehand on a scroll saw and filing the pieces to perfection—or so I thought. With a few weeks to spare, I finally put all of the pieces together, added the weights and pendulum, and there it finally was, a beautiful machine that did…nothing! The gears did not move; the escapement did not click, and the pendulum quickly came to an agonizing stop. I clearly had failed to reproduce prior work. It took weeks of error hunting, filing this and that tooth to a more befitting shape, and redoing an entire wheel where the wood had warped ever so slightly. As time grew shorter, each day I took the clock apart, then reassembled it, and put it through another test. Finally, a few days before the wedding, it started running with a resounding and robust tick-tock—it was music to my ears, and I stared at its hypnotic motions for a long time! As this example illustrates, it is far more difficult to reproduce positive results than to declare failure. Boyer’s plans were virtually perfect, yet they left room for me to introduce errors that needed to be hunted down and solved. Success required tenacity and diligence and, perhaps most importantly, the conviction (in this case based on a few hundred years of evidence) that it can be done. In the end, I developed the prerequisite expertise, a Fingerspitzengefühl (the delicate feelings we sense with the tips of our fingers) for the task at hand. Even then, when I built a second, different clock for my other daughter, it required a similar effort of fine-tuning. Reproducibility in scientific research has recently become a hot topic of immense importance to our community. Reports on the unreliability of published research have severely tarnished the image of our profession, as exemplified by an article entitled “How science goes wrong” published in the The Economist in 2013.4 Publishing bad science is bad for all of us. As a community we need to realize the importance of this issue and the major efforts that are underway to respond. In 2014, the ASCB convened a task force that issued a white paper,5 which includes tangible and constructive recommendations on how to improve current publication methods and standards, to ensure the publication of high-quality data. This is an excellent, must-read document, and I urge every researcher and publisher to implement its recommendations. There is universal agreement that every paper has to contain a meaningfully complete, detailed methods section that allows others to replicate the work. Yet papers continue to be published that do not, even in the very journals that deeply engage in the dialog on reproducibility. A recent example from my area of research concerns the first report of a crystal structure of eIF2B, a huge protein complex that serves as a translation initiation factor. Published in Nature,6 this is a nicely written and exciting manuscript that conveys a major discovery in the field. But when read carefully, the reader discovers that the experimental conditions for crystal growth are missing, being referred to as “submitted.” Thus there is no access to the most basic information describing how this work was done, until (and if) a follow-up publication becomes publicly available. In this particular case, the situation was amicably resolved: My graduate students contacted the authors requesting the missing information and, after a brief back-and-forth, we promptly received a preprint of the submitted work including all of the missing information. But I am at a loss to explain how—in this time and age and in the midst of intense reproducibility discussions—the reviewers of this paper and the professional editorial team at Nature could have endorsed publication of this work with such a critical omission. Analytical Replication attempts to reproduce the results from the same original data via reanalysis. Direct Replication attempts to reproduce the same results using the same conditions, materials, and methods as the original experiments. Systematic Replication aims to obtain the same finding of a given publication, but under different conditions (e.g., a different cell line, mouse strain, etc.). Conceptual Replication aims to demonstrate the validity of a concept or a finding using a different paradigm (e.g., in a divergent species). At first glance, this case appears to be another example where academic research produces unreliable and misleading conclusions. However, at least in this case, there seem to be problems with the negative data reported by Amgen. First, the Amgen researchers used different expression systems, yet protein expression levels were not compared with those in the original report. This is important as every assay has an intrinsic dynamic range and proteolytic systems can be saturated. Second, the siRNA knock-down experiments shown left 25% or more of USP14 behind, and nothing can be concluded from low efficiency knock-down experiments that yield negative results. 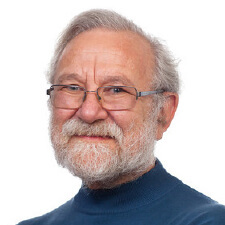 Third, results from the original work are strongly supported in publications by others13,14 (as pointed out by Thomas Kodadek in the open review of the Amgen work) but not cited and discussed. In this case it seems that conclusions drawn concerning irreproducibility are not convincing. This experience demonstrates the importance of submitting non-confirming results to peer review. Sasha Kamb, the head of research discovery at Amgen, states “we believe that interested scientists can look at our methods and results and draw their own conclusions.”12 Unfortunately, the Amgen researchers did not communicate with the Harvard group to resolve their discrepancies. Amgen also made it a condition that science journalists not contact the authors of the original work before the preprint was posted.15 The format at F1000Research now encourages the original authors to comment during its open review process of work disputing their conclusions, and we can hope a delayed dialog is still forthcoming. What I am trying to emphasize is that substantial scrutiny and dialog are essential to assess the validity of irreproducibility claims. Yet most readers of the popular media, including the general public and our politicians who make funding decisions, hear that we have a rampant reproducibility crisis in academic research. They hear that scientists cannot be trusted and that research funds are being wasted. Generic claims that some work is “not reproducible” are harmful; they can be devastating to a project and funding, and even derail entire careers. As a research community we have work to do—we need to continuously improve our ways of describing, standardizing, and sharing our methods and reagents, and we need to enable open discussion and responsible, rigorous publication of results, be they positive or negative. Engaging stakeholders in the assessment of results that refute prior findings is to me an essential ingredient in any recipe for success, but for this to work, scientists must be willing and supportive in helping others to reproduce their findings successfully. At best such dialogs may resolve the issue. At the least, I feel that journals publishing negative results must solicit and include comments and possible explanations by the authors of the original work. And we must aspire to the same high standards for papers publishing negative results as we do for those publishing positive advances. It takes hard work to make a clock, and it is much harder still to make it run. 2Goodrich WL (1905). The Modern Clock. Chicago: Hazlitt & Walker. 3Alberts B et al. (2015). Molecular Biology of the Cell. 6th ed. New York: Garland Science. 4Anonymous (Oct 19, 2013). How science goes wrong. The Economist. 5American Society for Cell Biology (2015). How can scientists enhance rigor in conducting basic research and reporting research results? A white paper from the American Society for Cell Biology. www.ascb.org/reproducibility. 6Kashiwagi K et al. (2016). Crystal structure of eukaryotic translation initiation factor 2B. Nature 531, 122–125. 7Errington TM et al. (2014). An open investigation of the reproducibility of cancer biology research. eLife 3:e04333. 8Freedman LP et al. (2015). The economics of reproducibility in preclinical research. PLOS Biol. 13:e1002165. 9Begley CG, Ellis LM (2012). Drug development: raise standards for preclinical cancer research. Nature 483, 531–533. 10Ortuno D et al. (2016). Does inactivation of USP14 enhance degradation of proteosomal substrates that are associated with neurodegenerative diseases? F1000Research 5,137. 11Lee BH et al. (2010) Enhancement of proteasome activity by a small-molecule inhibitor of USP14. Nature 467,179–184. 12Baker M (2016). Biotech giant publishes failures to confirm high-profile science. Nature 530, 141. 13Homma T et al. (2015). Ubiquitin specific protease 14 modulates degradation of cellular prion protein. Sci Rep 5, 11028. 14McKinnon C et al. (2016). Prion-mediated neurodegeneration is associated with early impairment of the ubiquitin-proteasome system. Acta Neuropathol. 131, 411–425. 15Kaiser J (2016). Calling all failed replication experiments. Science 351, 548.